Porkalob is generating plenty of electricity...​Her combination of emotional honesty and next-level virtuosity is hard to beat. Sara Porkalob inhabits her grandmother all throughout the OBERON space...with extraordinary skill. She is going to be a major, major star. I cannot stress enough how much you’ll enjoy the show. Intensely passionate. Porkalob switches on a dime to portray each character. She sings like a siren. Her renditions of “Sway” and “Love For Sale” are particularly arresting. A new high water mark for one-person shows. Not only is she a brilliant writer…but her detailed characterizations of over a dozen highly differentiated characters in the story is mind-blowing. Remarkable! Sara Porkalob is a multi-hyphenate wonder. The Wonder Woman takes us on a journey through time and space. Amidst the clutter of my grandfather’s office sits an ancient iPod connected to an ancient pair of speakers. His library of 500 or so songs can be divided into three categories: Haitian music, French chanson, and salsa and merengue...There are, however, a handful of tracks — 20, maybe — that do not fit into these three categories. They are songs of Fairuz and Oum Kalsoum, the fêted divas of Lebanon and Egypt, respectively, and arguably the two most influential singers in Arabic music. Although Haitian by nationality, Felix and Mona are ethnically Lebanese. Sara Porkalob has been listening to her family share stories about their history all her life. 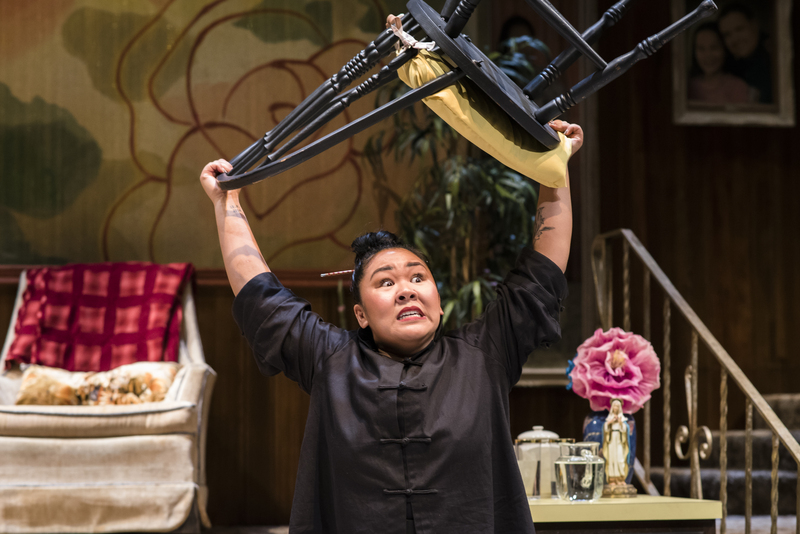 The tales — by turns outrageous, harrowing, heartbreaking, and hilarious...served as the inspiration for Porkalob’s visionary “Dragon Cycle,” planned as an ambitious trilogy of plays with music, created and performed by Porkalob herself and honoring the three generations of Filipino-American women in her family. Brilliant, beautiful, funny, wondrous. The visuals astound. I loved the final scene. Dive in. Fascinating! One of the more unexpected (and satisfying) works presented in recent memory. Director Sammi Cannold's cast certainly deserves the buzz. ★★★★☆! Daring, captivating, and wholly original...with just the right amounts of poignancy and fancy. Endlings brims with promise and originality.